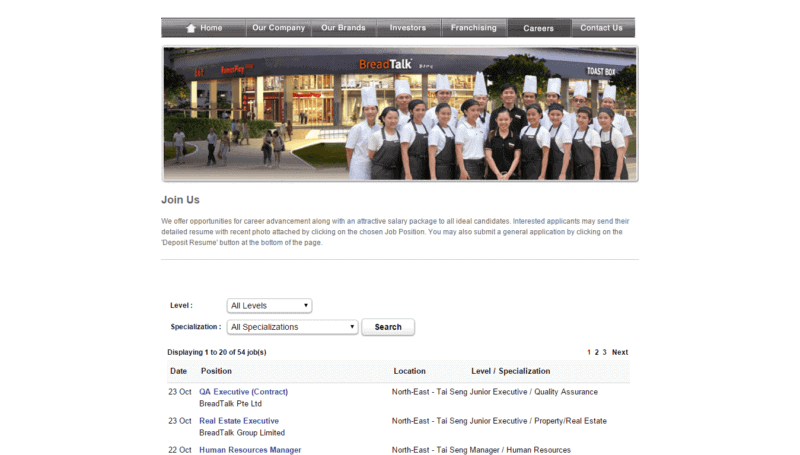 If you wish to find out more about Breadtalk as a jobseeker, naturally you would head over to Breadtalk career page to learn more. We offer opportunities for career advancement along with an attractive salary package to all ideal candidates. 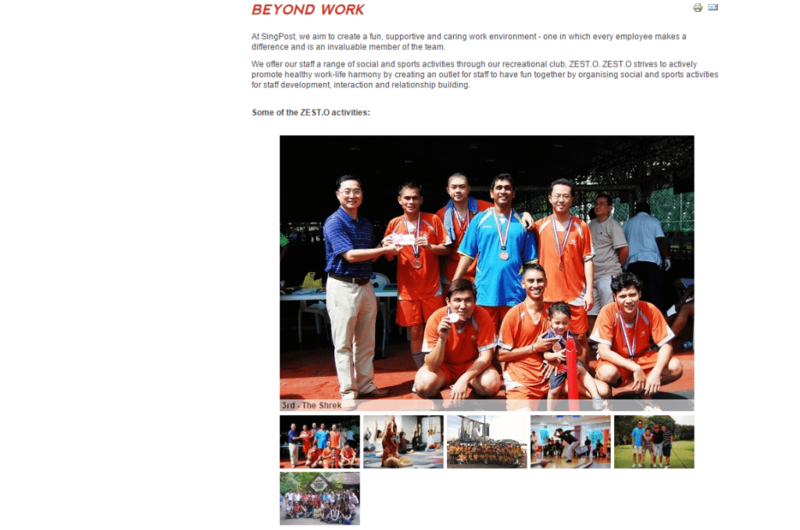 Interested applicants may send their detailed resume with recent photo attached by clicking on the chosen Job Position. You may also submit a general application by clicking on the ‘Deposit Resume’ button at the bottom of the page. 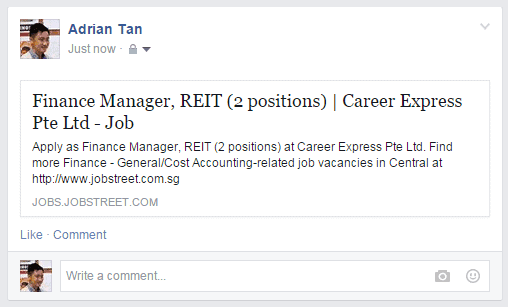 This is followed by a long list of job openings that are pulled over from their JobStreet postings. So how are they like as an employer? Not sure. What perks do they give? I don’t know. Who are the interesting colleagues within the organisation? Not a single clue. All you know is that they are hiring. It’s like knowing a lady is single but zero idea if she likes the same music as you or whether she has any psychopathic history. That happens when you have no employer branding. Employer branding is the process of promoting a company, or an organization, as the employer of choice to a desired target group, one which a company needs and wants to recruit and retain. The process facilitates the company’s ability in attracting, recruiting and retaining ideal employees – referred to as Top Talent in recruitment – and helps secure the achievement of the company’s business plan. A good employer brand strategy is like a good product brand strategy. Just look at Apple iPhone. According to a teardown report from research firm IHS, the components and manufacturing cost of a 16GB iPhone 6 cost Apple $200.10. The device is selling for $649 in the U.S. without a contract with a wireless carrier. That gives the device a profit margin of about 69%. Why are they able to sell at such a high premium? It’s all about how they brand and market themselves. According to YouGov BrandIndex 2015 Mid-Year Review, the Apple iPhone is ranked number 2 based on respondents perception survey. The ranking is higher than the company that makes it, which is at number 10. Because of the high positive perception, they could easily ask for premium for their products. Even when they screw up with their updates and other incidents, people will easily forgive them because they are Apple. The same can be said of an employer and branding is the best possible way to get those messages across. This is where they boast about their history, global reach, size, revenue, business segments, culture and all other positive stuffs that would put them in a good light. 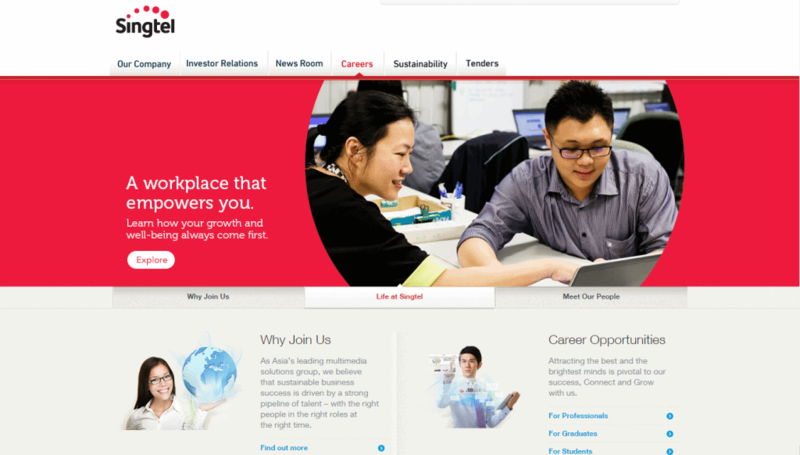 Here you get to learn about the perks and benefits of a Singtel employee. You get to know how they reward their people, the community work they are involved in and how they treat their employees beyond work. These are broken into 3 sub groups to make it more targeted towards different audiences – Professionals, Graduates, Students. 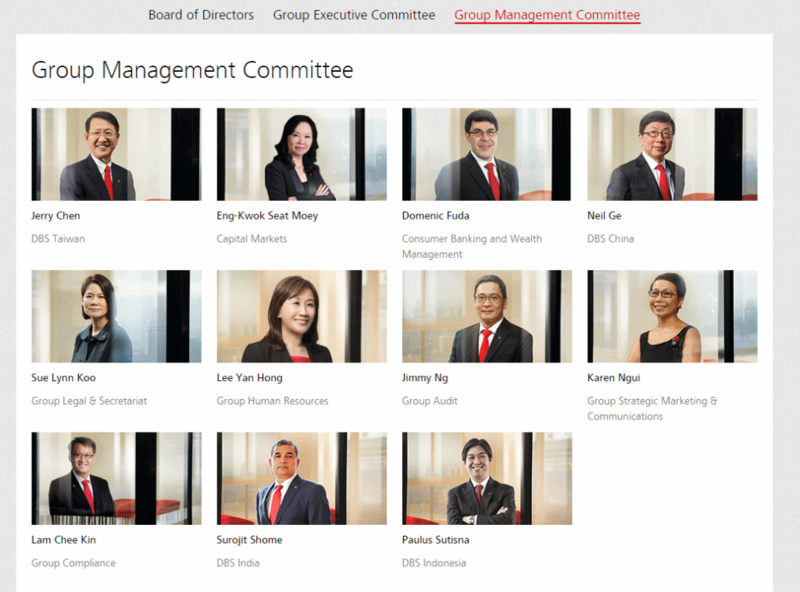 In case you don’t believe the trumpet blower, you get to read up and watch testimonials from actual employees on their experience with Singtel. 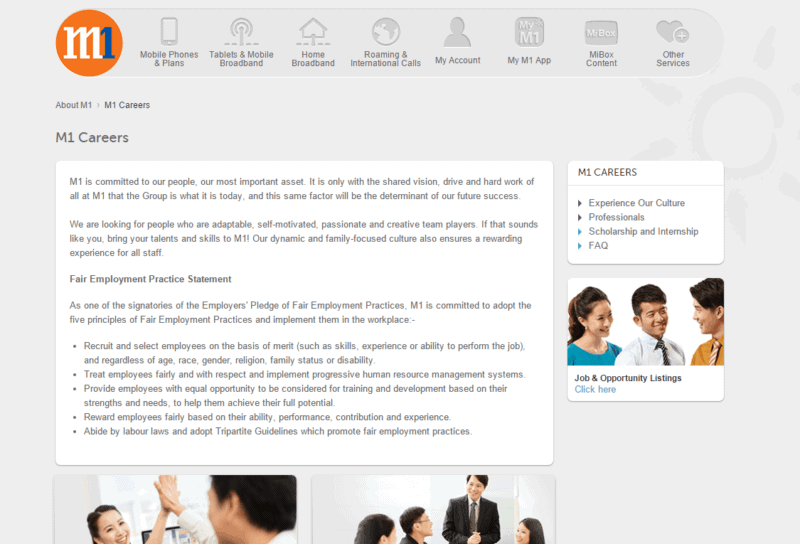 Compare with my earlier example, Singtel is doing a fantastic job in educating the public about them as an employer. So what would be required? Build an in-depth mobile-optimized career page that gives jobseekers an idea about your company and an accurate glimpse of the company culture. Include historic infographics, team biographies and detailed benefits that build a clear vision of your company. Educate and communicate with your team about what to do when employees hear or see something that might affect the company’s employer brand. Update your exit interview strategy to specifically include opportunities for employees to vent their grievances in person rather than taking their negative feelings with them when they go. You can see that it isn’t just an external superficial exercise. It requires drilling down to the core of the what organisation stands for. Not just from the employer but importantly from the employee perspective. 1. Build an in-depth mobile-optimized career page that gives jobseekers an idea about your company and an accurate glimpse of the company culture. The starting point of employer branding is to have a dedicated page or mini site that the public could have easy access to. Google now gets more search queries from people using mobile devices such as smartphones than it does from people browsing the Web on PCs. So it is significant to provide your audience with the best mobile-optimized experience. Your webpage will display optimally if it is mobile-optimized. 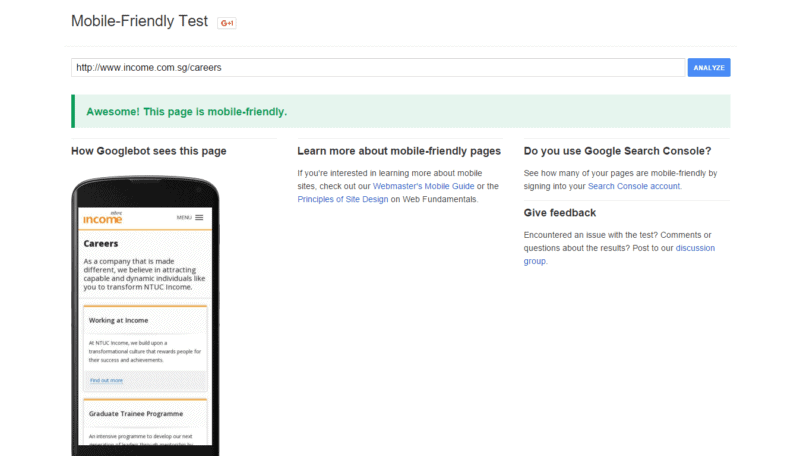 To find out for your current website, go over to Google Mobile-Friendly Test. Key in your site url and run the tool. 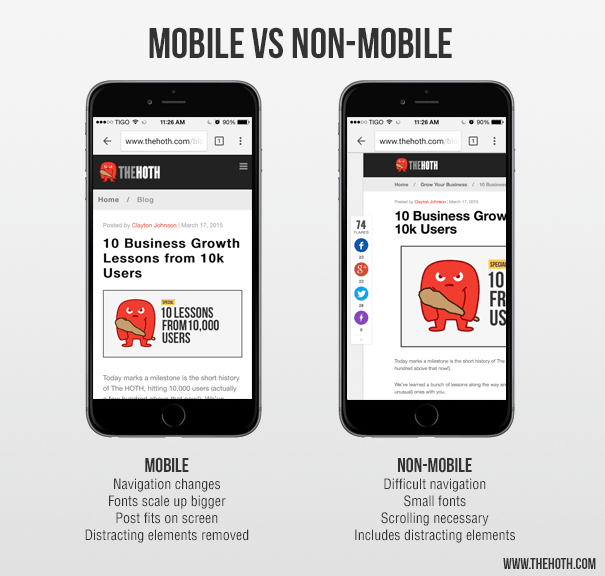 Having a mobile-friendly webpage is just one part of the equation. If you fill it up with superficial content, nobody will read it. Factual information about the company inception, history, size and revenue would be easy to secure. But the more important stuff is the company culture and employers need to recognize this is paramount to everything else. You can have the biggest office and highest pay but if the management is a prick, everything will go south quickly. Walter Chen, the co-founder and CEO of iDoneThis, wrote an excellent piece on company culture. Although it is targeted at startups, everyone else can learn something from it. 2. Include historic infographics, team biographies and detailed benefits that build a clear vision of your company. Don’t shy away from detailing down the accomplishments of the management team. Remember people don’t quit their jobs, they quit their boss. According to a Gallup Poll of more than one million employed workers, a bad boss or supervisor is the number one reason people leave due to the environment their boss creates and how they feel they’ve been treated. Conversely they would want to join a company that has great people they could learn from and look up to. Recognition and social proofs may not seem important to you but they are to your potential employees. And it helps to put your company in a different league compared to another that have no mentions or awards whatsoever. But when it come to awards, you want to be selective and choose the ones that are validated by the industry and not something anyone can simply buy with money. In Singapore, the most prestigious business award would have to be Enterprise 50. And also because of that, winning it would be really tough so that might become a multi year process. Scoring press mentions would be much easier by targeting the right moment to reach out to journalists. E.g. with the current haze situation, companies that specializes in air filtration could easily get interviews and mentions. 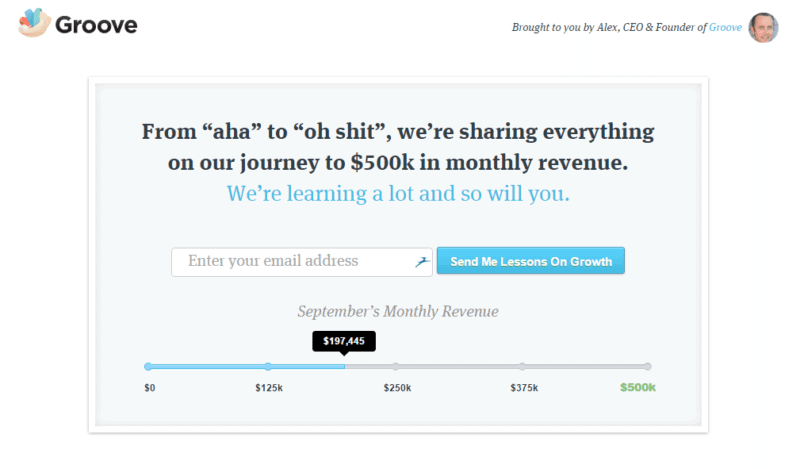 List down your financial projections publicly. People will respect the authenticity and transparency. And smiles are contagious as it breeds happiness, and happiness makes us want to share. That is the main driver for social media sharing and you want viral share when it comes to employer branding. The best content would be meaningless if nobody is ready it. And one of the quickest and cheapest way is via social media. With 3 million Singapore users on Facebook and 1.5 million on LinkedIN, you have a wide pool of audience. 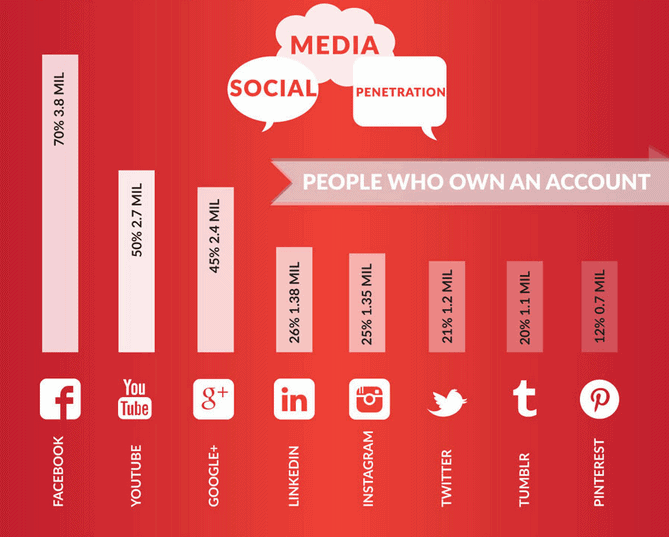 With 70% of social media penetration, Singapore has more than double the global average of 26%. But this isn’t simply sharing the link to your vacancy. This isn’t going to help you pull in the crowd no matter how many times you are willing to repeat it. Although the traffic on social media is high, there are a lot of noise too. 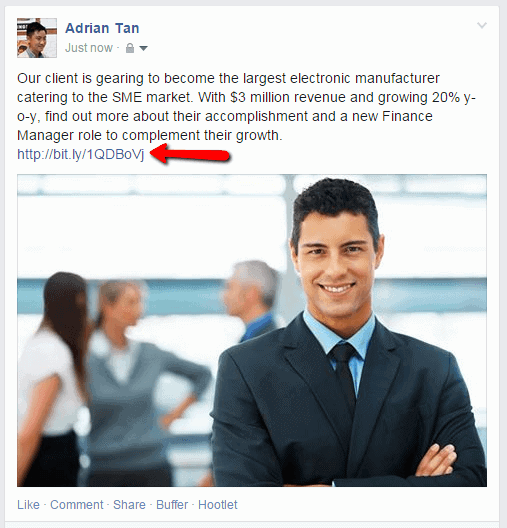 You need a well presented post to capture the short attention span of your audience. Like the one below which comes with a huge visual, a summary of the hiring organisation and a link that tracks and lead to more information about the role. 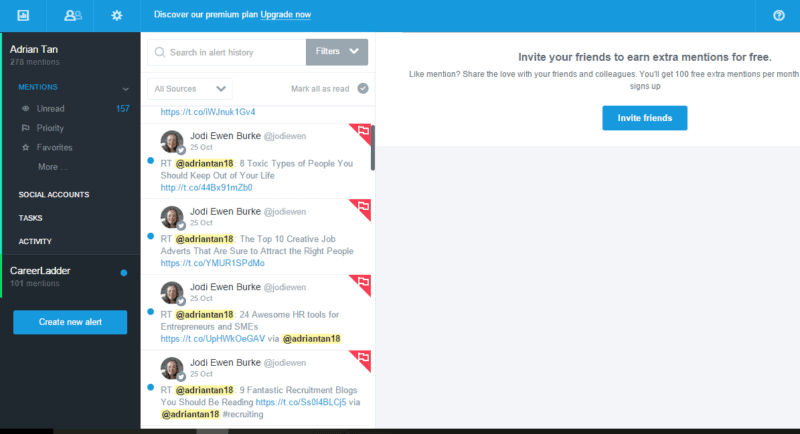 You can read my previous post on social media recruiting to learn how to do this. 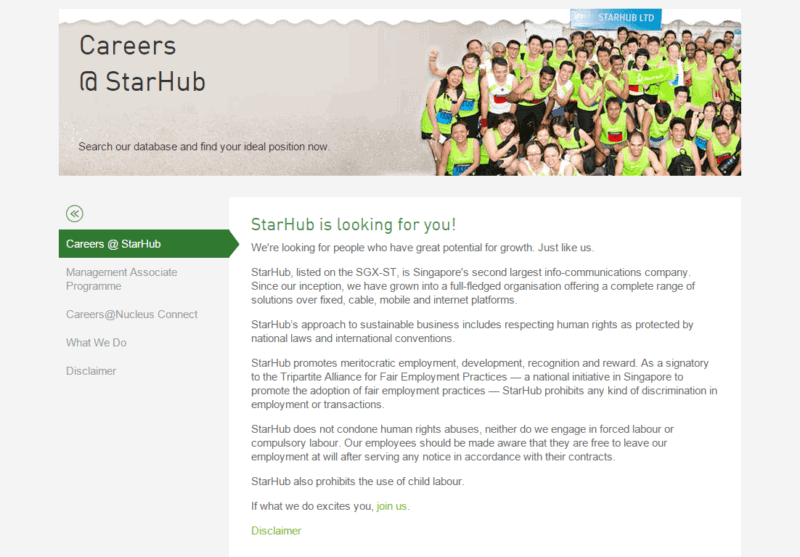 For Singtel, they would have to look at the career pages of StarHub and M1. From there do an external audit based on this checklist to see where they stand. Both career sites do not carry a segment on their management team so if you do have that, you have one leg up. 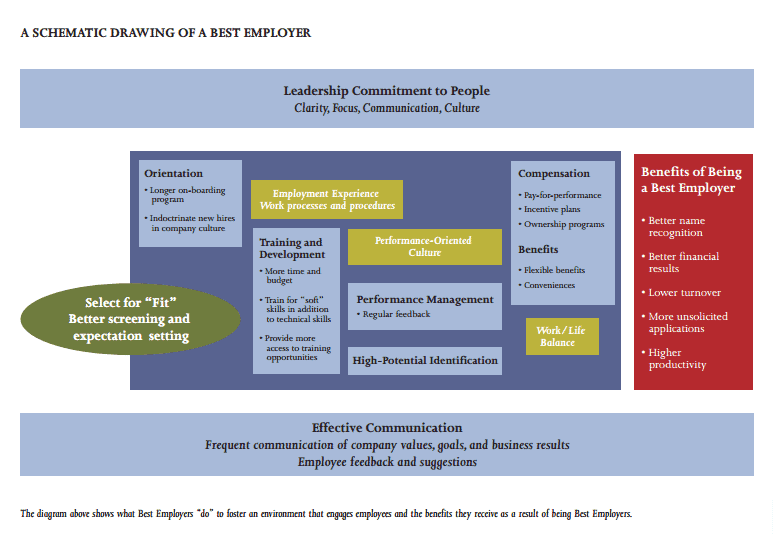 Although HR is listed here, they have to be empowered by the senior management. My personal preference is for the top honcho to do quarterly town-hall to address any questions that every level of employees would have. It would be far more effective than going through an intermediary like the HR department. Melcrum has an excellent article on how not to conduct a town-hall and what to do instead. 8. Educate and communicate with your team about what to do when employees hear or see something that might affect the company’s employer brand. Negative sentiments will always occur no matter what you do. Just ask any government in this world. The only thing you could do is to contain the issue as early as possible. But that could only be done if you are actually aware of them in the first place. Here is where Mention will come in useful. Mention is a media monitoring tool and it has the ability to monitor billions of sources in over 40 languages so you won’t miss anything being said about what’s important to you. And since mentions are in real time, you’ll be able to reply right away within Mention. Many organisations would argue this would open a can of worms and lead to more problems to deal with. The thing is there would always be problems. The question is if you prefer to deal with many small ones or one big career-ending one. And it doesn’t have to be tough to execute. There are tools such as 15Five that could be deployed in minutes. 15Five is a Saas employee engagement tool that collects employees inputs to a set of questions on a weekly basis. 10. Update your exit interview strategy to specifically include opportunities for employees to vent their grievances in person rather than taking their negative feelings with them when they go. Usually when you reach this stage, the only thing possible is to make sure people don’t leave in angst and work against your employer branding strategy. However when employees decided to leave, many thought processes would have occurs and their mentality firmed. It might be too late to interject. Instead of figuring out how to improve and do exit interviews better, take preventive measures and implement ‘stay interview’ instead. Stay interview is a term coined by Dr. John Sullivan, an HR thought leader and former chief talent officer for Agilent Technologies. A “stay” interview, writes Sullivan on TLNT, is a one-on-one interview between a manager and a valued employee. Its aim, quite simply, is to learn what makes employees want to keep working for you. Likewise, it’s designed to elicit what might make key employees want to leave. Conduct enough stay interviews, and you might find your employees are citing the same reasons for staying (or wanting to go). 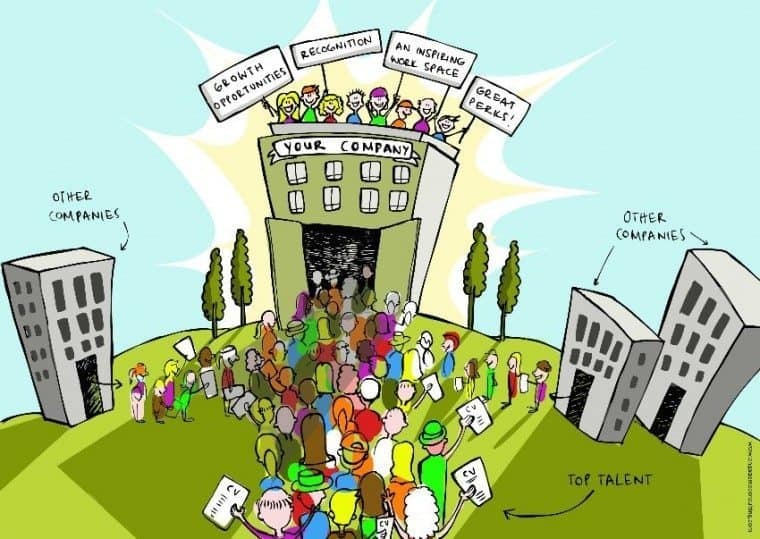 What are the factors that is making you stay with the company? What would have occur to make you consider leaving? Here are 20 possible stay interview questions you should consider asking. Employer branding isn’t just sugar coating what you don’t have but to publicize what you have seriously put in place and using a combination of visuals and outreach to drive higher awareness of that. And it is hard work but with the knowledge age we are in, it is critical to put our best picture in front of your audience.